You see the beat up signs leading you into the city, shops are boarded up showing signs of dereliction, the lost roam around the slums trying to find meaning in their pitiful existence. The economy is in a mess and the government is out of control. I kid…I love going to Birmingham, to see the sights and culture that it offers. However, you won’t find that in Nightlancers, a game from Adversity Games. 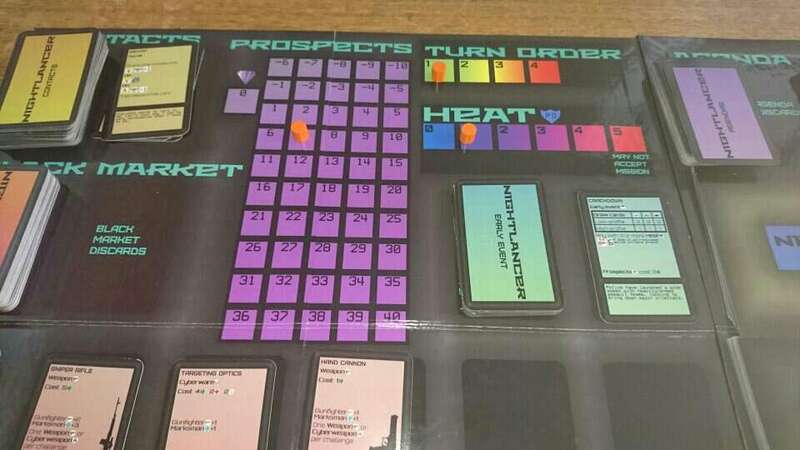 It is a boardgame steeped in lore that is set in Birmingham, 2099 where life has gotten out of control, where technology has advanced to allow cybernetics to become a daily part of life. Push to far, and you become a shell of your former self. Here is a snapshot of the NightLancer lore from the Adversity Game Website. Britain 2099. The last century has seen massive technological advancement but catastrophic world events. Nuclear wars, economic collapse, government controls and civil unrest increasingly take their toll on the world. People continue to lose their sense of self and reality as they implant cybernetics and use exotic drugs to make themselves more than human. Those that change themselves too quickly become disassociated from reality and turn violent and dangerous, called the Techshocked. Fearful neo-luddites fight against transhumans and cybernetics manufacturers, claiming that they are protecting humanity. The Techshocked form into rampaging Shockpacks. Law enforcement is overwhelmed and focuses on the fights it can win, leaving the people in the slums unprotected and left to defend themselves. Transhumanity is available for the wealthy to improve themselves. The people struggling in the slums must spend all of their energy on survival, while being vulnerable to greater violence if they do stand out as transhuman and try to get ahead. Some of the underdogs take on dangerous illicit work for whoever will pay so they can buy themselves a better life. They must balance success against overreaching. Progress too slowly and they will not escape before a crumbling society catches them. Pushing themselves too hard or sacrificing their ideals can force them into Techshock. I was excited to get this game from Adversity Games. It is worth noting that I am looking at the Prototype copy. The setting appealed to me and when I read the background on the various clans, and people within the world, it felt believable. I could imagine life being bleak, the only solace in the embrace of technology in Birmingham. Is it because, I know of the place and can relate, maybe. However, I’m a sucker for story and lore within games and I think that even in the limited space of the manual and cards, it delivered. Each character felt unique from each other with skills that complemented their role within the world. When you look at Nightlancer, you may want to put it in a category, is it a euro style game or is it a game with lots of conflict, heavy in theme and some luck or is it an RPG? When, I think about it, I do find it hard to put it in a box and say, you are this! I found that Nightlancer took elements from each and gave it a voice of it’s own. I want to say that it felt more like a role playing game where I had my character and I had to buy equipment, develop my skills and take on the increasing harder missions as the rounds went on. 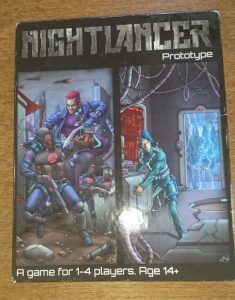 When I got the prototype of Nightlancer, I enjoyed the artwork and loved how it conveyed the feeling of cyberpunk. I’m not well versed in other art of cyberpunk, but I had no problem in visualising the characters. When, I opened the box and looked at the manual, I have to admit that I did feel intimated by the number of components but this was mitigated when I actually set out the pieces needed to play the game. The manual held a lot of information about the gameplay and it did a good job in explaining the characters, gameplay, icons and the lore of the game. Each player takes on the role a Nightlancer, an individual that has a certain set of skills that aid them in the quest to achieve a better standard of life. 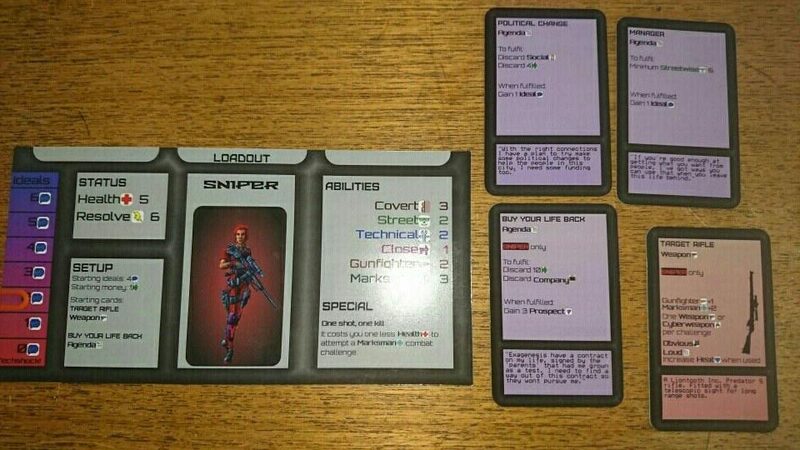 They range from a Guard, Cyber-hacker, the sultry eye candy or the elusive sniper. I felt that each role fitted within the setting and nothing was out of place in terms of skills and responsibilities. All a Nightlancer cares about is getting on in the world, getting the big score so that their lives can be better. 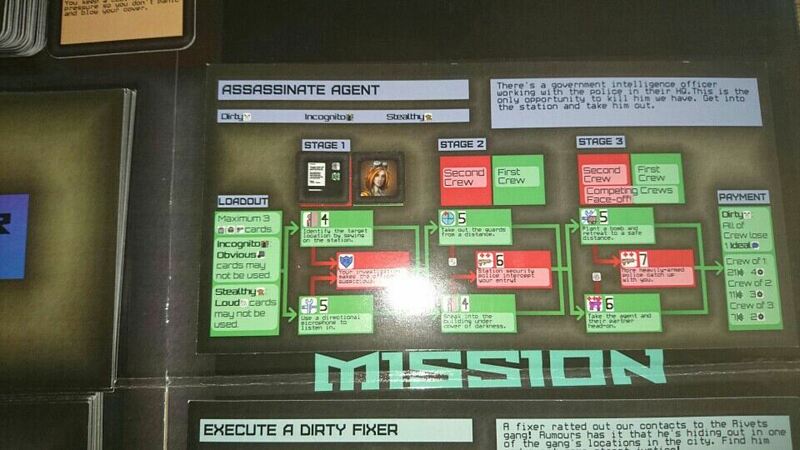 For the player, this means going on Missions to score credits which in turn, can earn them Prospects. However, for a Nightlancer, this is no easy feat as to earn credits, they have to risk their lives going on missions and this is the crux of the game. A player has to prepare themselves to take on a mission of which there are two flavours, A high level mission that has more danger but also more rewards if successful, or a more low key mission that is easier to get though (but still challenging) and a modest reward. Depending on how many players there are, determines the number of missions that go out on the board. Preparation: This stage for the Nightlancers is the intelligence stage, it is here that they find out what contacts they can use/obtain. They find out what missions they have on offer. If there are any events that occur outside the mission, it has to be resolved and if needed, they get to have downtime where they can recoup any lost health and resolve. If they owe money, then it is during this phase that they have to repay it back. Once they have seen the missions that are on offer, the Nightlancers have a choice on which mission to pick, and if they want to attempt the mission alone to get all the glory and rewards or allow the opponent to aid them through the various mission rounds. It’s a choice only that person can make. If the player doesn’t want any help, then they can block the other players from attempting that mission by taking the second slot of that particular mission. Hit the Streets: Next, the Nightlancers hit the dark and murky streets of Birmingham, trying to buy up the latest gear from the Black Market (probably the Bullring), raise their reputation aka Prospects, or fulfil an agenda. Now, you ask, what is an agenda. 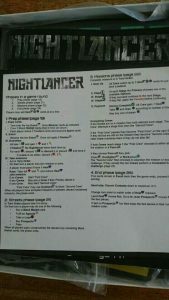 Each Nightlancer has a goal (aka Agenda) that they need to fulfil during the course of the game. Buy Your Life Back (Sniper). – To fulfil this, the Nightlancer has to spend 10 casey (cash) discard a company contact card. If they manage to complete the objectives for this Agenda, then that particular Nightlancer gains 3 Prospects. This is a nice touch, it breathes life into a character that allows them to take notice of the world around them instead of just trying to rush from one mission to another. 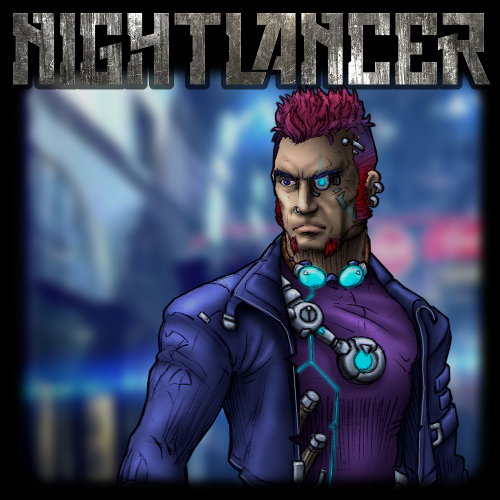 Another option is they can go to the loan shark and get some money that they have to pay back later, this allows the Nightlancer to get the skills upgrade or technology they need for an upcoming mission. Go Go Go (aka Attempting the Mission): Once the intelligence has been sourced, missions have been chosen and the Nightlancers have geared up, it’s time to attempt the mission. Some of the missions will have conditions that prevent them from being as efficient as they could be (An example would be the sniper cannot use her gun because it’s Obvious and Loud and the mission doesn’t allow for that). They have three rounds to succeed in the mission and if they fail then they will have to face the consequences which is usually hand to hand combat or increasing the level of heat that they are exposing themselves to. Here, it is a balance of knowing the skills of your character v.s the reward that you think you will get at the end of the mission. There are certain special challenges that Nightlancers can attempt but only if they have the relevant skill card for them to do it, this includes Cracking, Demolitions and Distraction. Although for Nightlancers like the Cyber Hacker, he can attempt the cracking skill without the need for a card due to the perk on his character card. So, it helps to pay attention to the mission path and see if your Nightlancer can get through without too much trouble. If you have been the leader for the mission and have allowed the other Nightlancer to assist, then it only takes one of you to succeed however as mentioned before, when it gets to the end of the mission, you have to fight your comrade to ensure that you get all the spoils. Hell, it was you that wanted the mission in the first place, it should be you that gets the glory. Got to give the other Nightlancer the option to leave peacefully or be subjugated to your wrath. After the mission: Your heart rate has dropped, the mission is over and you’ve either got the credits, the police know about you (as your Heat level has increased) and it’s time to head back to your base to recoup and plan the next mission. You only stop when no more events are available to draw from. When that happens, the Nightlancers sell all of their gear, pay back their loans or try to increase their reputation/prospects by using their credits. The Nightlancer with the highest Prospect value wins. They are the best Nightlancer this side of the Bullring. In this game, there is never one approach to winning. Throughout the game, you have choices on what you can do. Do you push yourself to the limit always going for the high stake missions with the minimum of gear and hope for the best, praying that you won’t get tech shocked or bring to much heat upon yourself? Do you go the slow route, taking low rated missions, saving until you become an unstoppable juggernaut with the best equipment and skills. Do you piggy back on the will of others, always going on their missions and beating them in the final round? Do you save your cards and play them at the right moment during the mission to sabotage your fellow Nightlancer so that they fail the mission, get beat up and increase the heat on themselves. This game is refreshing, it’s a game that’s set in a world that could easily occur, with the increase on our reliance of technology, maybe us as the human race will become reliant on technology to improve our lives. You only have to look at people walking around the busy streets of Birmingham, heads down looking at their phones not interacting with the people and environment around them. Not knowing how to get from London to Birmingham without the use of GPS and if the signal goes down, then they are lost because they didn’t research that they had to turn left at Coventry, instead of right. This game does look like a complex game when you first open the box. That is what I felt when I looked at the board and the manual. However, once you take the time to look at it and explore the world, it becomes easier to understand. 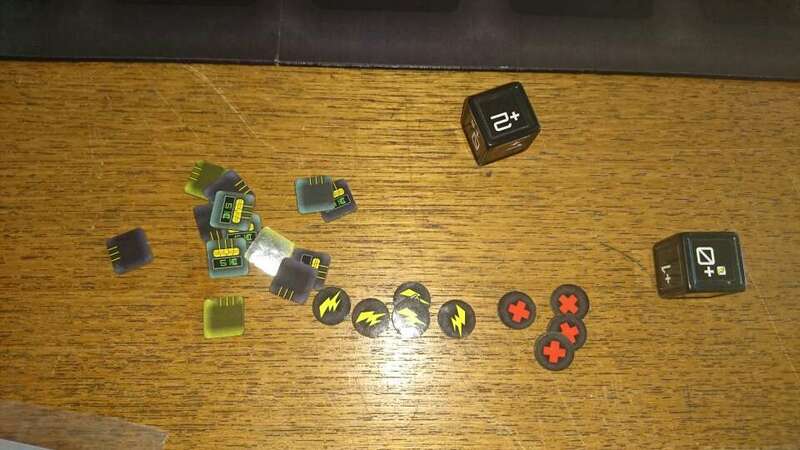 That is what I did when I attempted it as a one player game. Is it the best at that player count, no as I feel that you need the banter and the to and fro with another Nightlancer to get the best out of this game. Whilst not a true role playing game or a game where you can replay the characters over and over while carrying over stats, I did get the feeling of a character progression within the game session and I liked that. As a player, you feel invested in being a Nightlancer and trying to better your life without succumbing to TechShock. 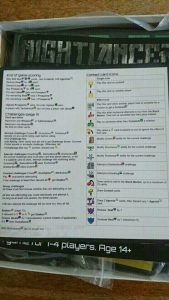 Icons: This game is icon heavy on the cards and thus it does need constant reference to the rulebook but what helps is the cheatsheet that is provided with the game, it explains everything on the card and even tells you the page number in the manual that you need to go to if you need more information. So, this may be a problem if you have trouble with iconography. It doesn’t make it truly language independent but it helps. Manual: This is a double sided comment – I love that the manual is rich in detail and lore, it explains the rounds very well and at the back tells you the lore and history behind the various groups that exist within the Nightlancer universe. Speaking as a QA Engineer, the user experience of reading the manual could have been more streamlined as the setup of the board for various players is in the middle of the manual rather than at the start. If it was me, I would do the setup at the start, then explain the icons and then the lore. It might have been me, but the objective on how to win wasn’t obvious within the manual (on the cheatsheet card it was). Table Space: As my table space isn’t that huge compared to others, Nightlancer does take up a decent estate of the table as it has two boards to accommodate all of the cards, plus the cards and tokens for the individual players. I would say that it’s slightly bigger than Pandemic. Apart from that, I have no other issues with the game. The downtime between players is not that great considering that you have to be thinking about what you have versus upcoming events and missions. You do have to pay attention to the other Nightlancers to ensure that they don’t get too far ahead and it also means that if you want to play a card that hampers them, you can’t be on your phone and then wonder why they were able to successfully complete the mission when you could have reduced their dice result. So is this a game that I would buy if I saw it in a shop? The answer is yes, based on the description, the setting and the theme. It hits all of my wants in a game, it’s not overly complex, the run time of the game session does not drag after the first play through. It might not hit the table as often due to finding the time to play, what with family life but my wife enjoyed it enough to have a few rounds over the period that I had the prototype. Posted in Co-Operative, Review and tagged Adversity Games, Cyberpunk, Cyberwar, Prototype. Bookmark the permalink.